Review Summary: The multiplicity of plots and subplots act as a dampener and transform the film into a somewhat rambling investigation into the state's counter-terrorism programmes. 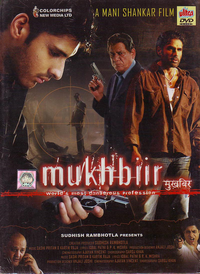 In the second film about secret government agents this week, Mukhbiir traces the life of young orphan Kailash (Sammir Dattani) who’s being trained by Intelligence honcho Rathore (Om Puri). On the whole MUKHBIIR is a weak product. At the box-office it has dim chances. The last 10 minutes are directed with a certain amount of passion. But that’s it. In other words, you can walk in very, very late into Mukhbore if you must. Incidentally, Sameer Dattani is quite efficient and vulnerable. Surprises never cease. The multiplicity of plots and subplots act as a dampener and transform the film into a somewhat rambling investigation into the state's counter-terrorism programmes. "It's the most dangerous profession in the world," says director Mani Shankar. All in all, expectations of a strong film are sadly let down due to a weak script and screenplay. One just hopes that the fate of the movie doesn’t affect the hard work put into by the actors. This one probably isn’t worth the run to the cinema.